The unique relationship between Amélie Housing and St Vincent de Paul Society enables Amélie Housing to provide appropriate housing to a higher proportion of households with high and complex needs. This model has been documented and involves Amélie Housing being primarily responsible for property and tenancy management, with the Society providing support and facilitating access to services required by tenants. 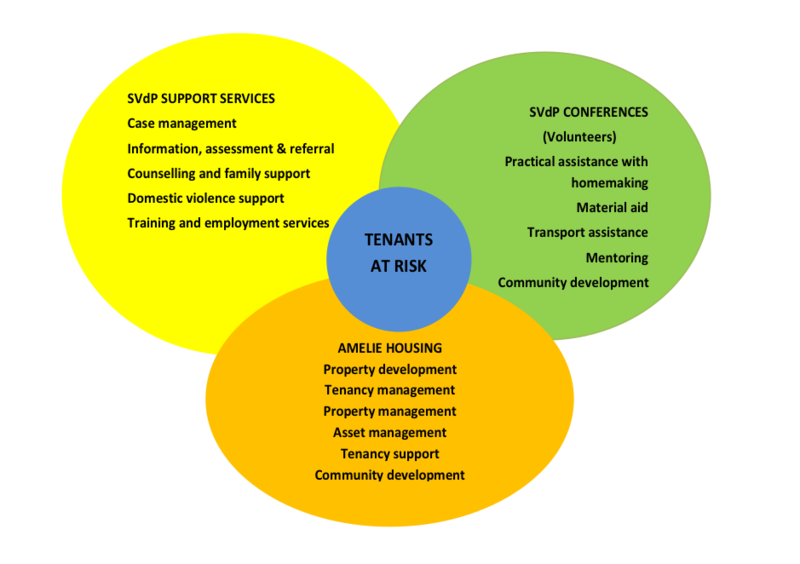 A case management approach is provided for tenants at risk, enabling Amélie Housing and the Society to collectively assist tenants to stabilise their tenancy and enhance their quality of life as represented in the Figure below. If the Society does not have case management staff in the area then Amélie Housing will develop partnerships within the service area to provide the same level of support.